Courts order Gov. Brown to Comply - Time to Increase the Pressure! PELICAN BAY SHU PRISONER REP SPEAKS ABOUT THE IMPORTANCE OF JULY 8,2013. Greetings to all those men and women of like minds and spirits who are going to volunteer and stand with us in Solidarity in the upcoming peaceful struggle to force positive changes to CDCR that will benefit all prisoners and all our outside families and friends. Prison is a lonely, dark, cruel reality where you immediately become trapped in a time warp on one of the many modern day plantations that have sprung up like trees across America. On March 4 Matt Duran and Katherine "Kteeo" Olejnik were released from the Sea-Tac Federal Detention Center where they spent the last five months for refusing to testify before a Seattle grand jury investigating the anarchist movement. A third resister, Maddy Pfeiffer, remains in prison, but has been moved from solitary confinement to the general population. 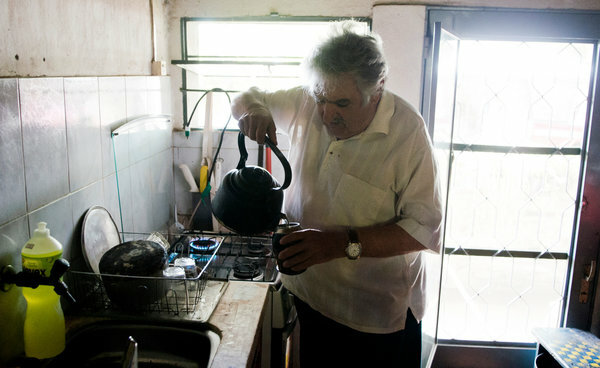 José Mujica preparing a mate, the herbal drink offered in a hollowed calabash gourd, in his kitchen.